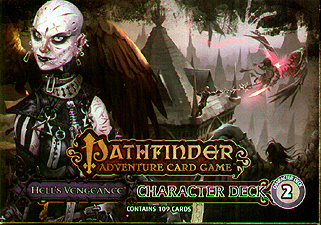 A second helping of evil awaits you in the Pathfinder Adventure Card Game Hell's Vengeance Character Deck 2, featuring three new evil characters from the popular Adventure Path. This 109-card accessory for the Pathfinder Adventure Card Game gives you the cards you need to ruin the day of any paladin on the block. These scurrilous characters can be played in any Pathfinder Adventure Card Game base Set or in the Pathfinder Society Adventure Card Guild organized play campaign.